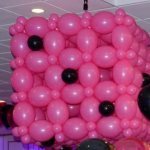 Good, easy to hook up to ceiling, good ladder and customer with a lot of imagination - here is the recipe for a good, unusual balloon decorations. It is an abstract thing that does not have any particular meaning or goal. All they have to do is to bring to the room color and motion. 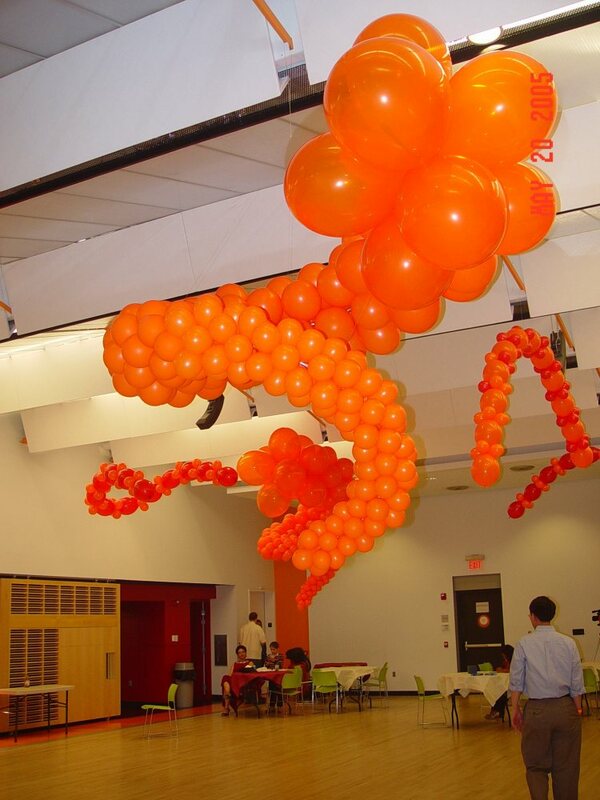 Each balloon creation is balanced and is suspended from the ceiling on a single fishing line. 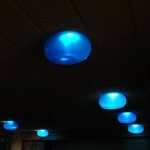 That allows each of them to rotate around the line and change the look of the room. Another variation on the subject: ceiling decorations for a New Year in a busy restaurant down town Boston, Mantra. There is not even a square inch on the floor. Also, it is a New Year Eve, so let it be snow! Especially if we do not have it outside... So, here we go, air filled balloon arrangement to be suspended from the ceiling. Gives a very good impression of the snowfall. Same New Year Eve, The Greatest Bar, down town Boston. 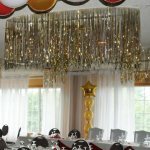 Similar idea - different type of balloon clusters suspended from the lighting fixtures - another way to have balloon decorations above the head. One of the possible solutions if the ceiling can not be touched. Once in a while the ceiling is not just high, it is very high, but still can be reached. 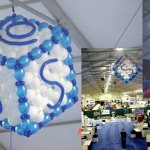 Sometimes it is a trade show and lifts are available, sometimes it is a space with some kind of metal structures on the ceiling that can be used to hook up to, even without a lift (telescopic rod, etc...). 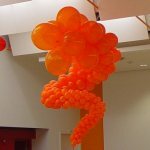 Then there is a big temptation to use the fact that balloons are light and a big structure can be built relatively quickly and lifted to decorate a huge space above the party of a trade show. An atrium of a hotel is a good example of a space like that. 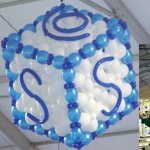 First good example of such a structure is a 3D logo of SYSCO FOODS we have made for the company trade show. A balloon sculpture of a cube (about 7' each way) with their logo on it (please see the Picture 5 and 6). It was attached to a small battery operated motor which what attached in turn to the metal structure of a huge tent, 30' above the floor. For the three days of the trade show the logo was rotating. Would I do it again now, I would add the balloon blinkers to attract even more attention. 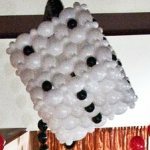 On two other occasions it was a casino nights (one was a Bat Mitzvah party, another one was a employee appreciation day, Pictures 7 and 8) so we have created dice. On the Bat Mitzvah it was on the motor too. 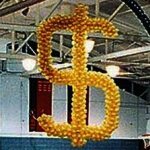 To finish up the casino theme, here is a dollar sign, made for a fundraiser casino night in school (again - a story: when I went to see the owner of the casino company, I ask him: "how come people plaid real money? Isn't it illegal?" - "Sure it is. What's your point?" was the answer). Picture 9. The idea of decorating atrium - like spaces is great and full potential is not reached yet. However, one of my colleagues made a huge parrot many years ago, in a space like that, and, if I am not mistaken, got into the Book of Genesis. 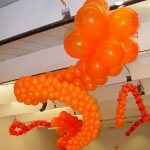 I think it was the largest balloon sculpture to the date. This is so nice and elegant that it has to be used on every party in the room with low ceiling! Decorating the low ceiling is tricky - anything you put on it will make it lower, unless it is flat. Or almost flat. Do we have flat balloons? No. But we have something close - so called GEO Balloons. They look exactly like a bagel, with the hole in the middle. This is not a link-o-loon, this is not easy to make (to tell you the truth, I do not know how they make it at all, I just love the fact that we have it! ), but it has a lot of unique uses - decorating low ceiling is of them! Take a look at pictures 10. 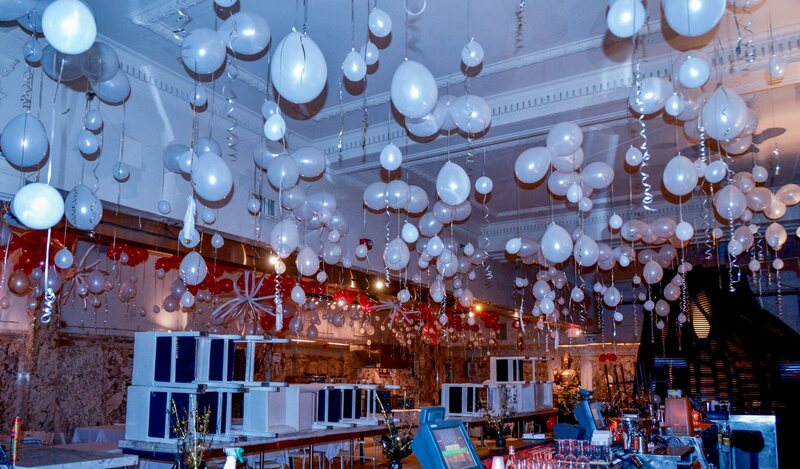 The GEO balloons are inflated with helium and are "laying" on the ceiling. But not just laying, right under the lights. Light is shining through the hole and illuminate the balloon. 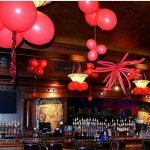 So if the color of the balloon is the party color - the whole room is party color! Very simple and elegant solution for small rooms! On a side: will they pop? No, not really. As some of us had learned in school (well, supposed to...) hot air is rising. So do not place balloons (or anything that can burn for that matter) above the bulb - it will pop. If you place whatever it is under the source of the heat, it is safe, unless it is touching that source. If you have read that far, you can guess by now that the subject is infinite - we can come up with as many ceiling decorations as needed. So this one is not really another way, but the whole area of thinking about the subject. It was a wedding of a friend's daughter. She got a room for the wedding practically free, but the room had a few dirty spots on a relatively low ceiling. So we had to come up with some kind of a cover. 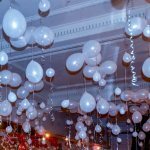 My beloved ceiling balloon clusters would not be the right choice - ceiling is too low for that. So we took a piece of foam core, a spool of mylar ribbon and scotch tape. Than we cut an abstract shape out of the foam core piece and stick a lot of sort pieces of the ribbon. Then we took scissors and make the ribbons the length we want - pretty much like in the hear salon. Here is our cover for the spot, here is a new type of decoration! Picture 11. Interestingly enough that if we make a hole in the foam core, we can put the thing (sorry - do not have the name for it yet!) over the lighting fixture, then the mylar ribbon will do even more! Here we are done with the ceiling decoration. There are more pictures to show and stories to tell, but main idea is here. In the next post about unusual balloon decorations we will take a look at the room shaping sculptures.